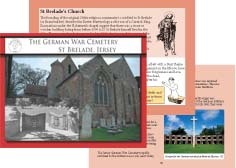 From 1 July 1940 to 8 May 1945 Germany occupied the Channel Islands where its forces soon established their Heldenfriedhof or Heroe's Cemetery in the historic holy site of St Brelade's Churchyard. The first burial occured in July 1940, just 10 days after the Germans occupied Jersey. A military cemetery brings us face to face with the contradictions and horrors of war. The emotions can be mixed when dealing with the once occupying forces of Jersey evgen after such a long period of time. Click here to download part of this publication as a PDF.